Be sure to join us at the coffee and cookie reception for the Scandinavian Boundweave: Timeless Traditions exhibit. It’s tomorrow – Saturday, April 24, from 10-2, at the Textile Center of Minnesota Community Gallery. Here’s a krokbragd rag rug by Judy Larson, hanging on one of the two bright lime green walls. Before we brought the pieces to the gallery we worried about which ones would be suited to that background. It was a needless worry! For many pieces the intense green makes the colors and patterns pop. But if you miss the opening, you still view the show through May 22. This beautifully-scaled runner is a perfect example of the challenges we encountered in mounting our exhibit. The pieces varied widely in size and color and scale. Veronna Capone’s “Playground Chatter” is exquisitely woven. The sett is fine (10 epi) and the resulting patterns invite close scrutiny. But it would be lost on a wall if displayed next to a broader weaving with larger patterns. Also, it was the only piece using a shade of red tending toward coral. If it is set next to a piece with a darker, purplish red, the effect is jarring. Happily, this piece fit perfectly on its own narrow gallery wall. On Tuesday, April 20, several of our Scandinavian Weavers Study Group met to mount eighteen pieces of varying sizes, colors, shapes, and scale on the walls of the Textile Center Community Gallery. When we first laid them out on the floor the goal of displaying each piece to its best advantage seemed daunting. Too much visual stimulus, too many opinions. How would we get to the other side of this task? We found one pair of weavings that worked together, and other groupings fell into place. Like filling in crucial words in a crossword puzzle, the remainder of the task got easier, though there were still challenges to finishing it successfully. Hours later, the result was beautiful. Many people helped, including Ann Haushild, Mary Litsheim, and Claire Caughey Most. 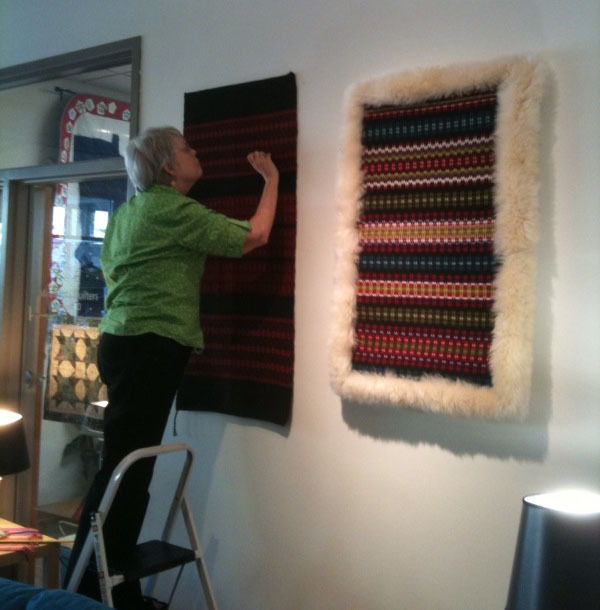 Sheryl Schwyhart from the Textile Center gave us great advice, and Margaret Miller helped place Sara Williams’ six-foot rug on a prominent upper wall using a pulley system. Special thanks are due to Kathleen Caldwell and Sara Williams who didn’t stop for one minute all afternoon. Please visit Scandinavian Boundweave: Timeless Tradition. The show is rich in color and pattern and variety. A great time to visit would be Saturday morning, April 24, from 10-2. Coffee and cookies will be served! The structure of boundweave invites experimentation with pattern. When nineteen pieces by fifteen weavers are gathered together, that’s a lot of pattern and color to absorb as a viewer. Within a single piece many of the bands can be different from each other. The fragment from Mary Litsheim’s “Nordic Nature Color Memories” shows the fun of working with geometric patterns. Is this a band of diamonds? Or is it a band of Xs.? It’s both, of course, but it illustrates how a narrow band of white seen from a distance will be more interesting as you come closer. Taking in the nineteen pieces in the “Timeless Traditions” show will be a pattern-intense experience. A boundweave piece was used in a traditional Norwegian home as a coverlet on a wooden corner bed or as a covering in a sleigh. Sometimes it was a decorative wall hanging. Melba Granlund wove a laptop bag. While that is a nontraditional use, it is a practical, protective use of thick wool yarn. The weavings in the Timeless Traditions show vary greatly in size, something that isn’t clear from the details shown in this blog. A detail, such as the one in this post, doesn’t reflect the scale or effect of the entire piece at all. Pieces vary from long and narrow (less than nine inches), to a six foot long rag rug. Inspired by a cradle coverlet in a Swedish museum, Jan Mostrom wove a rosepath cradle coverlet from a pattern in a Swedish book, Väva efter gamla mönster på fyra skaft (cover photo) by Lena Nessle. Similar baby coverlets were sometimes made from many narrow bands sewn together, but the pattern in the book uses rosepath for a similar densely-patterned effect. Patty Kuebker-Johnson runs Color Crossing, a fabulous yarn shop, gallery, and studio space in Roberts, Wisconsin. She has often said she doesn’t have time to get her own weaving done. That may be true, but she is responsible for helping many other weavers learn about looms and weave structures. Patty’s monochromatic krokbragd piece with danskbragd pickup, Purple Haze, is a beautiful study in geometry. So many of the pieces in the exhibit have eye-catching, high-contrast color combinations. Patty’s piece draws you in with subtle shades of purple and gray forming restful lines and diamonds and crosses.